SiriusXM Backspin Presents The Art of Rap Festival follows Ice-T’s critically acclaimed 2012 documentary Something from Nothing: The Art of Rap and the festival which played to massive crowds in Orange County, California and the Bay Area. Backspin is SiriusXM’s channel playing classic hip-hop from the 80s and 90s. 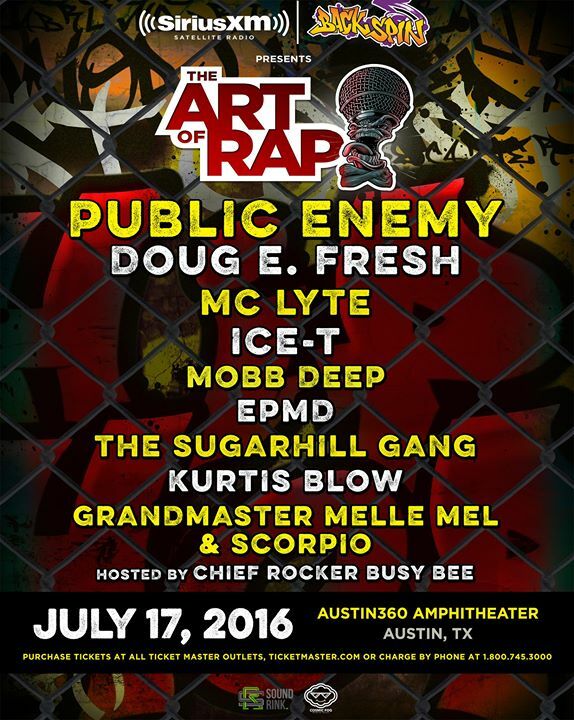 True to the documentary and the 2015 festival, this year’s lineup is impressive and scheduled to include performances by Public Enemy, Doug E. Fresh, MC Lyte, Ice-T, Mobb Deep, EPMD, The Sugarhill Gang, Kurtis Blow, Grandmaster Melle Mel & Scorpio and hosted by Chiefrocker Busy Bee, among others.